If most of your clinic duties are in primary care, you may only rarely encounter alcohol poisoning. However, this topic is a favorite of the boards in the Nephrology section and one that does certainly arise in emergency departments and on the inpatient wards. 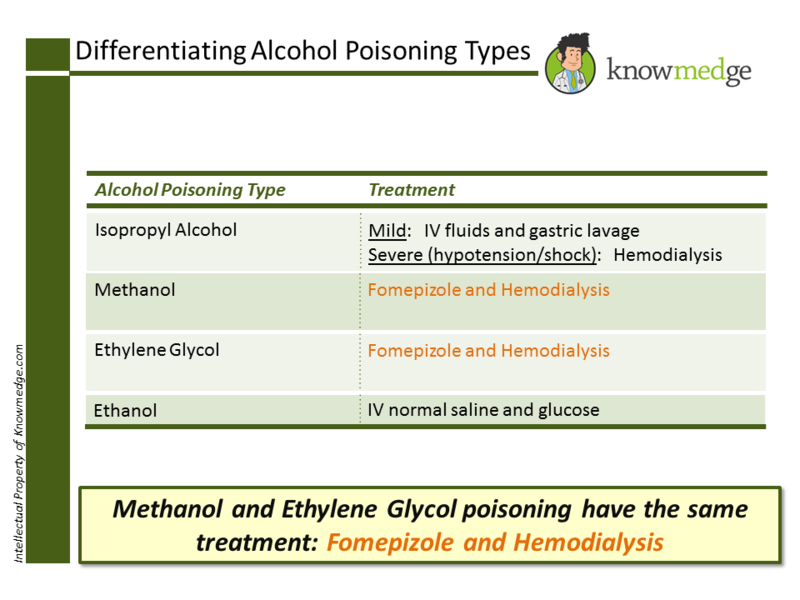 For the USMLE and ABIM examinations, it is important to know the specifics of alcohol poisoning, including how to differentiate among Ethanol, Methanol, Isopropyl alcohol, and Ethylene glycol. In fact, in a patient suspected of having consumed too much alcohol, these will be the answer choices rather than simply “alcohol poisoning.” So how do we arrive at the correct diagnosis? 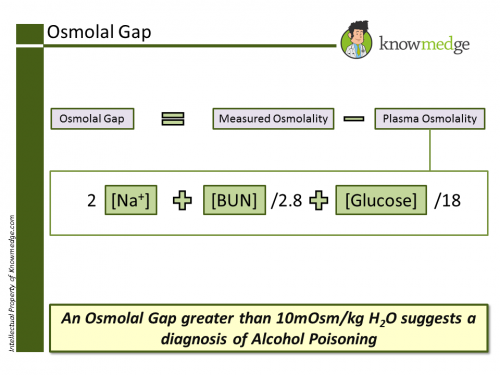 A normal osmolal gap is 10mosm/kg H2O. A larger than 10mosm/kg H2O value suggests that the unmeasured osmoles is attributable to an alcohol. Of the 4 causes, only isopropyl alcohol does not have an anion gap metabolic acidosis. In fact, the patient will likely feature a normal acid-base status despite being so severely ill that they are in a coma or at least hypersomnolent. Vision abnormalities or abdominal pain suggest methanol due to this alcohol’s effects on the retina and the pancreas. While the eyes and pancreas are damaged by methanol, the kidneys are the main organ affected by ethylene glycol due to its breakdown to oxalic acid that can cause nephrolithiasis, especially calcium oxalate stones. 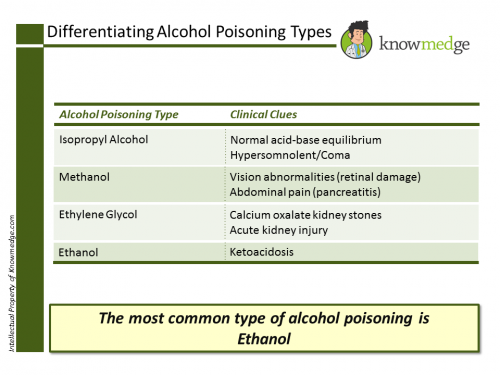 Ketoacidosis is primarily seen in ethanol poisoning (the most common type of alcoholic poisoning). 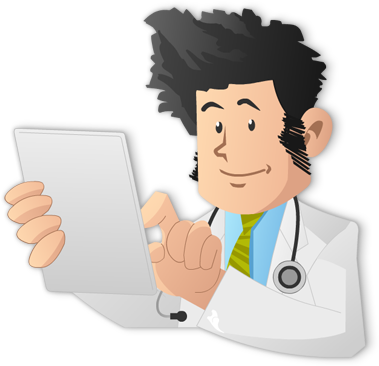 The ABIM and USMLE exams are known for testing both the diagnosis and treatment of various conditions. Alcohol poisoning is no different. You will either be asked what the most likely diagnosis is in a patient with an overdose of some type or what the best next step is in his or her management. Isopropyl alcohol treatment is dependent on the intensity. Ethanol poisoning has the most basic management: IV fluids including glucose. 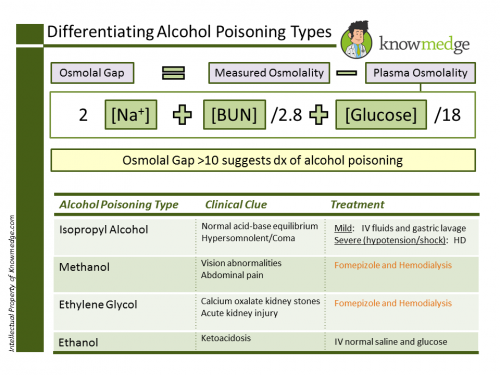 Now, that you’ve reviewed alcohol poisoning for the ABIM and USMLE boards, let’s give you all the info in one simple Knowmedge visual. Thanks in advance for sharing your thoughts below if you have additional tips for the other users in the Knowmedge community.